Avidasports™ is the tool to motivate and teach swimmers to train smarter with your coaching. Avidasports™ gives them customized, personalized training in a way that nothing else can. Swimmers experience unmatched improvement! Are you a coach who believes in accountability? Do you want every length of your swimmer’s training to have purpose? Each coach can now cover an entire practice, leveraging their coaching to give every swimmer their own personal coach, resulting in incredible accountability and results. Avidasports™ is your answer to work with every swimmer, every length, resulting in engaged, meaningful training everyday. Using Avidasports™ helps to increase the rate of swimmer improvement – Avidasports™ swimmers experience an average season improvement of 4%. 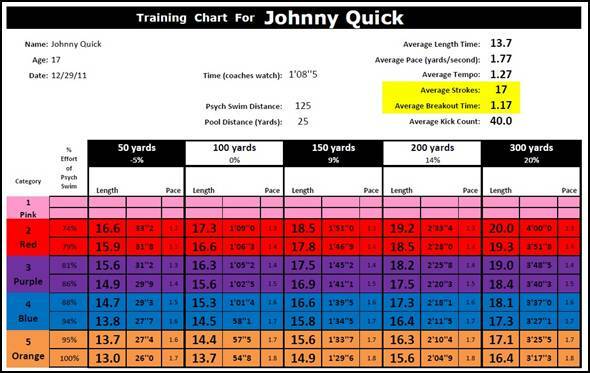 One Avidasports™ coach developed this training chart. 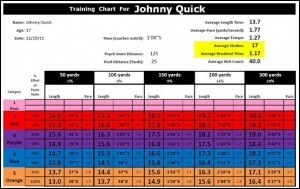 Using test sets and swimmer input he creates a chart for every swimmer. It is designed to provide a very clear performance expectation of each swimmer during practice. Daily workouts are photocopied and given to each lane. Now both the swimmer and coach have an expectation for the Avidasports™ data that should post. Continue the excitement of improving with your Avidasports™ solution! How fast can you “gear up?” Here’s a summary of the time it takes a swimmer to get their Avidasports™ gear on for practice. See how swimmers of all levels have improved their performance by clicking here. Learn how swimmers have used Avidasports™ to become better swimmers, resulting in one personal best after another!